Posted on Friday, April 28th, 2017 at 3:02pm . 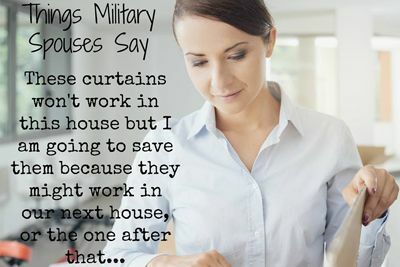 The meme from Julie at the “Soldier’s Wife, Crazy Life” blog about reusing curtains from home to home rings true with every PCS move. Sometimes, however, it might be easier to start with a clean slate when it comes to furnishings in a new home. Depending on the age and condition of your furnishings, you may not want to take everything you own. You may want to start with an almost clean slate. But it doesn’t mean you’ll have to spend a lot of money to rebuy new items. You can check out the local thrift stores or Craigslist for some gently used pieces to start. But, if the thought of buying used furniture makes you cringe a little, you need to know how to do it. Rashon Carraway runs Rashon Carraway Design, a company in Charlotte, NC. Carraway has also been an avid thrift store shopper, where he has bought and refinished furniture pieces, selling them once redone. In fact, he used to be known as “Mr. Goodwill Hunting.” Recently, he offered a “1 Room – 1 Hour Virtual Design Consultation,” and has written an e-book titled, 10 Steps to Decorating a Room for $250. After spending some time going through his blog, you’ll learn how to recreate some of his pieces for your home. 1. What is the most amazing restaurant you have been to? Why do you like it? 2. What are your favorite colors? What colors do you absolutely hate? 3. How do you currently use the room we are tackling? Before you even set out to start checking the local thrift stores or Craigslist, you need to make a list of the items you want to purchase. You won’t find everything in one trip, and you need to make sure you can transport the items once you find them. Some thrift stores may offer delivery on larger pieces, but that will be an additional cost. Once you find the pieces you want, everything you buy should be cleaned thoroughly, both inside and out, with material-appropriate cleaners. If you’re looking fordining room chairs and you find a set that works structurally, but they’re old and not so attractive, they can be primed and repainted, and even have the upholstery on the seat changed out, if there is any. In fact, Carraway recommended this tutorial from IHeartOrganizing.com on refinishing chairs. When the project is done, you’ve created a one-of-a-kind chair set, personalized with the colors and fabrics you choose. In fact, one of Carraway’s favorite dining room redo’s isn’t even his. It’s from Desire to Inspire. “A lot of people do not like bold colors in their spaces (I am one of them), but this room just happens to be a nice ray of sunshine,” he said of the table and chair set. Dressers are another piece of furniture everyone needs. One of Carraway’s posts is devoted to 10 beautiful black dresser makeovers. “If you have a little time on your hands, I would so tell you to pick up a dresser, make it over and put it in your home. It is completely worth it,” he said, of the selection in thrift stores. However, something Carraway advised against buying used is lamps. Because of the prices of lamps and shades in thrift stores, “…you will have spent $25 on a lamp that you could have easily bought brand new with a returnable receipt from any department store, unless you just want something with vintage flare in your home,” Carraway said. Of course, you’ll want to show off your newly decorated home once it’s finished. Take another look back through Carraway’s blog, make a couple of his recipes, and invite your friends over for a house warming party! What were some aspects of homeownership you looked forward to, once you moved into your new home? Share with us in the comments! Thinking about buying this spring? Start your search with us!